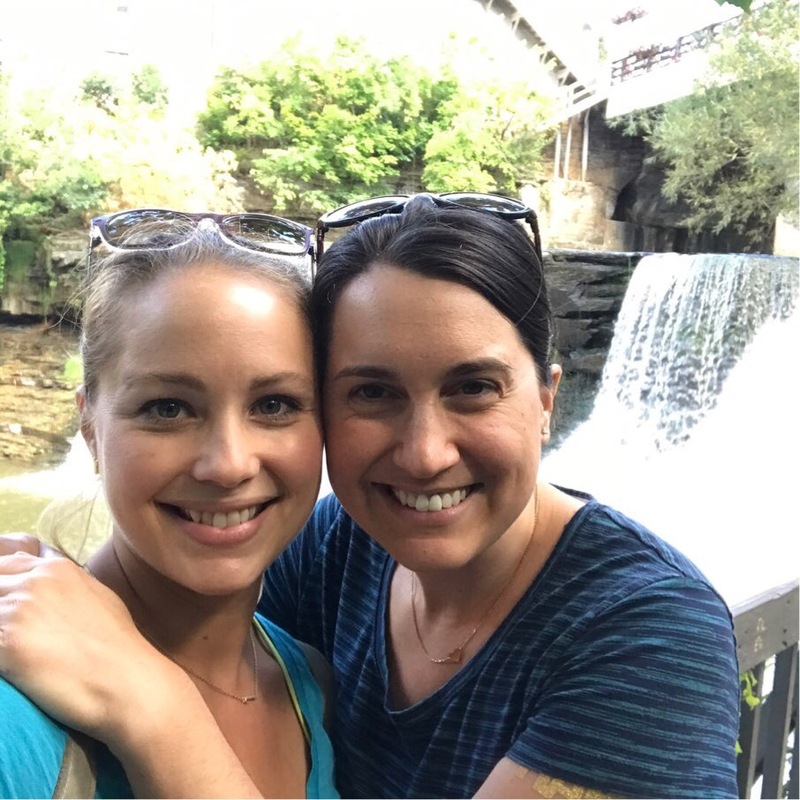 My bestie, Emily, and I met halfway in Chagrin Falls, OH, back in August on a beautiful Sunday morning. The quaint village–much like East Aurora–is just outside Cleveland, a short drive from the highway and smack-dab in the middle of Dayton, OH and East Aurora, NY. We spent our day walking around the village during their weekly farmer’s market, eating a picnic lunch and stopping into boutiques. Sitting by the waterfall (!!) to have lunch was a highlight; East Aurora may be super cute, but we do not have a waterfall. One thing Emily and I like to do when we’re together is go on a walk or a hike. There is a park near her house that we go to just about every time I’m visiting, called Sugar Creek. I love it and look forward to our walks and talks very much. 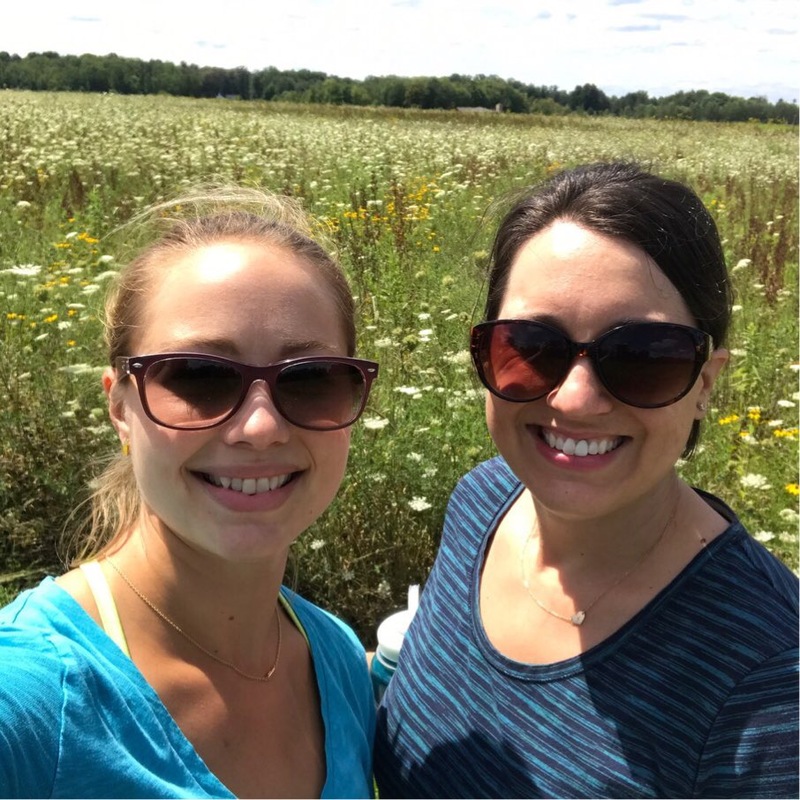 She’s more outdoorsy than I am, and I’m more of a runner than she is, so our middle-paced, more-than-a-walk, less-than-a-hike is a perfect way for each of us to feel we got some exercise and quality time. Just outside Chagrin Falls is a small park with a trail running through both a wooded area and a meadow. We enjoyed both the sun and the shade and walked 3-4 miles by the time we got back to our cars. One thing Ohio is famous for is Jeni’s Ice Cream. I know I’ve blogged about this before, but if you’re new, Jeni’s is a ’boutique’ ice cream shop (started by Jeni, of course) with about five or six locations around the state, as well as new ‘scoop shops’ in Los Angeles, Nashville, Chicago, Charleston, St. Louis, Atlanta and Washington, D.C. Her ice cream is all handcrafted and often features unique flavors like Goat Cheese with Red Berries and Riesling Poached Pear Sorbet. The Salty Caramel is the most popular flavor, and the best caramel I’ve ever had–if it weren’t so expensive to ship, I’d keep that stocked all year long! Just checking the website for this blog made my mouth water! We stopped in for some cones and snapped a selfie in front. I’m always so thankful the scoopers behind the counter are patient and let me try so many flavors…I’m that girl! So indecisive. I know that purple scoop was Wildberry Lavender, another one of my faves. After our ice cream, it was time to say goodbye. We grabbed sandwiches to-go from a local shop and headed to our cars. I left my house around 6:30 am, we both arrived around 10 am, departed around 4 pm and I was home again well before 8 pm. It sounds like a whirlwind, but it really wasn’t. 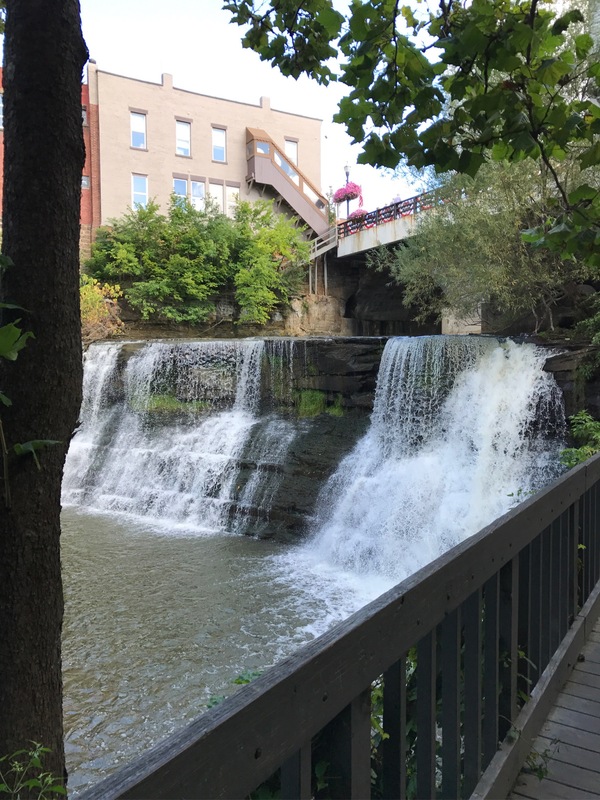 We decided Chagrin Falls will be our ‘go-to’ meet-up indefinitely, whether it be for a girls’ day/overnight, or our annual New Year’s Eve get-together. 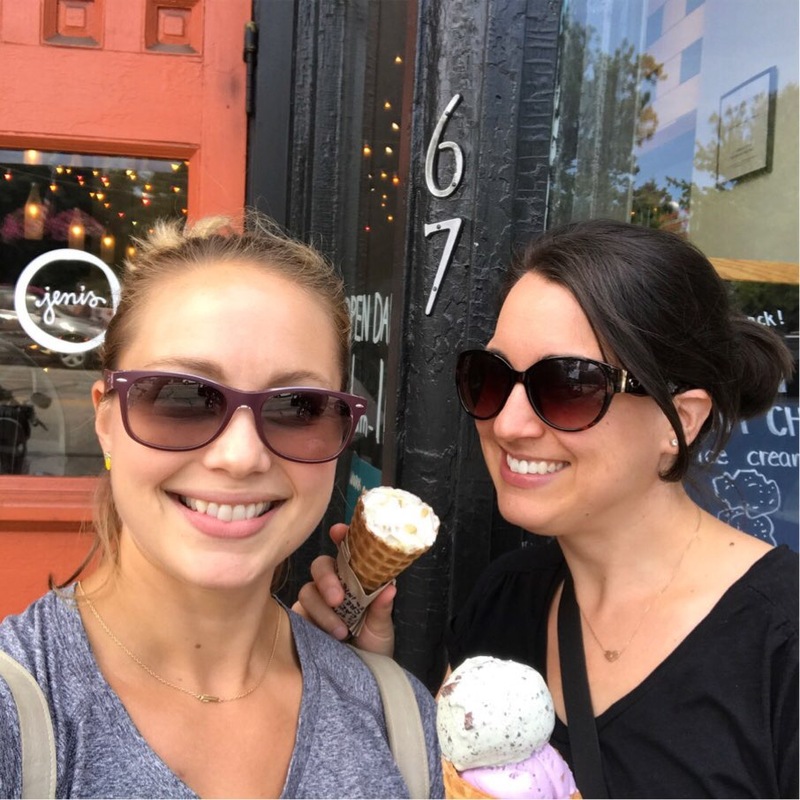 Posted on October 21, 2017 October 21, 2017 by thehealthypineapplePosted in Slice of Life, TravelTagged chagrin falls, jeni's, jeni's ice cream, Jeni's Splendid Ice Creams, Sugar Creek Metropark. Previous Previous post: Erie Marathon!!! !